Grow Your Own Medjool Date Palms! We Specialize In Medjool Off-shoots! How to Purchase Delicious Fresh-Picked Medjool Dates! Our medjool dates are "True Organic" with no pesticides, no chemical fertilizers, and no preservatives. They are pure naturally sweet delicious medjool dates! 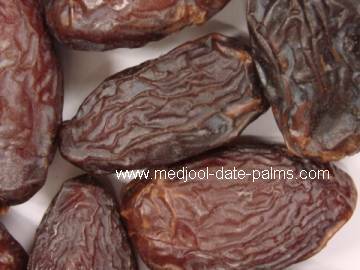 Did you know that medjool dates are 100% fat free? How to Purchase Fresh Date Palm Flowers! Date Palm Pollen is used in Pollination & as a Health Suppliment. Date palms are dioecious, which means that there are both male date palms and female date palms. 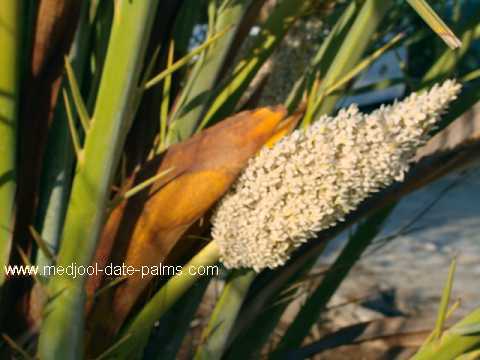 The male date palm yields flowers that produce the pollen, and the female date palm yields flowers which will become dates, if they are pollinated. The date palm produces identical off-shoots which can be removed & planted. 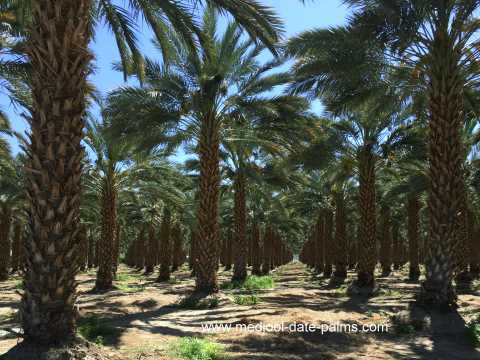 For more than 5000 years, date palm offshoots were the only way that a date palm variety could be propagated, and by this means superior quality date palm cultivars could be selectively planted and passed down from one generation to the next. Some date palm cultivars like the zahidi date palm are several thousand years old! Each year we remove medjool date palm offshoots from our medjool palms and plant them in large pots and boxes to be sold or re-planted later. Our Rooted Medjool Off-Shoots have been in their containers for at least 2 years. They now have developed their own roots & are pushing out new vigorous growth! 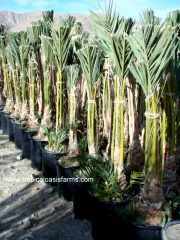 For medjool date palm offshoot sales information in California, call 909 941 1060. 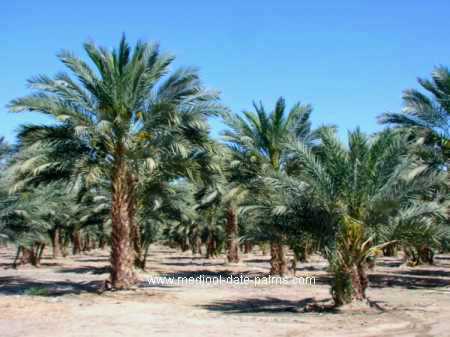 Welcome to our website about medjool date palms! Want to grow your own date palms? From the date palm's earliest recorded historical details to the nutritional content of dates, and most everything in between! See our ordering info for Medjool Dates. © Copyright 1999-2018 www.medjool-date-palms.com® All Rights Reserved.